Arches, Caves, and Islands tour is one of our most diverse, most fun, and most popular kayak day tour in Dubrovnik. Kayak to three beautiful islands and two charming villages in the Elaphite Archipelago. Swim & snorkle in the hidden Green Cave, paddle under an awe-inspiring limestone archway, and give yourself to the thrill of exciting cliff-jumping challenge! photos at the end of the tour. - Prices are fixed in Croatian Kuna (HRK). Prices in other currencies are informative and liable to exchange rate fluctuations. NOTES: We require a minimum of 2 persons to run this tour. Starting from Dubrovnik’s Gruž Harbor in the morning, guests will arrive on the island of Lopud. After a safety talk and kayaking instructions, we set off across the channel for the island of Šipan. Heading south and west, we first paddle to a natural stone arch which is a perfect photo-op. Under this archway, you can see the Adriatic sea open up in all of its glory. Next, we regroup and paddle along the coast to the hidden Green Cave. We’ll then tie up our kayaks and get ready for a wonderful morning of swimming and cliff jumping. But first, we’ll grab snorkels and masks and swim down through the cave’s opening. Very few know about this cave … even the locals. Inside,there is plenty of room for swimming and even standing. This large, and safe, cave opens up to reveal an ethereal green light caused by the sun’s reflection off the sandy bottom. After, the group will swim in the deep cove outside the grotto’s entrance and try some cliff jumping. We continue on to the delightful fishing village of Šuđurađ, on Šipan, for a lunch of local delicacies. Following lunch, we paddle back toward Lopud. 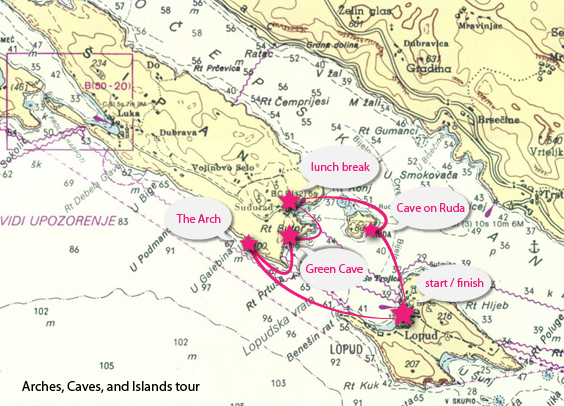 Before calling it a day, we stop at the island of Ruda - our third island of the day – to explore and kayak into another cave. Guests will be back on Lopud in time for a walk and for the evening ferry back to Dubrovnik. Please find instructions of where to meet us on the day of the tour using public transportation or walking bellow. In case you want to book an inexpensive transfer from your hotel or apartement to the meeting point, please send us an email and our staff will get back to you with all the necessary information. We meet in Gruz harbor, Dubrovnik’s commercial port, to board the morning Jadrolinija ferry. Please check the meeting time on the confirmation email. It is different for Sunday and Holidays. Gruz is a 35 minute walk or a 10 minute bus ride (bus 1A, 1B, or 3) which depart every 10 min from Old City’s Pile Gate (west gate). 15 Kuna to the bus driver or buy a 12 Kuna 1 way ticket at the kiosk. From Lapad and Babin Kuk, it’s not necessary to come to Old City. The ferry pier is across Gruz Bay, you may walk or bus to the deepest part of the bay, then walk north along the east side of the bay past the morning market (red & white umbrellas), past tourist boats and luxury yachts, to the traffic light next to the ferry pier. We meet at the pedestrian traffic light next to the ferry pier. There is a blue & white “Travel Corner” sign, a bus stop, and a sidewalk café. Your guide is wearing a white “Outdoor Croatia” T-shirt with 4 colorful squares. Your ferry ticket is included in your tour price. - First and foremost - water. If you don’t already have your own, you can buy cheap bottled water at any market or kiosk and you can reuse the bottle. Croatian water (from the sink) is very clean. - Sun block, lotion, and protection is only slightly less important than water. The sun here can be very strong, especially in hot summer months. Sunscreen is for more than making sure you have a great tan. It could save your vacation. - We also suggest a hat, sunglasses (with a leash), and a long-sleeve T-shirt if you are particularly sensitive to the sun. - Bathing suits should be worn under your clothes. - Usually the only thing you’ll need for a kayaking day out is a small towel. - We provide dry bags for your belongings but boat space is limited. In these bags you can place wallets, clothes, and cameras without fear of water. - Active sandals (Teva, Merrell, etc.) are great for kayaking, and light hiking. If you don’t have active sandals we will provide you with basic aqua shoes. - Cash is still the best kind of money in Croatia. Markets will take credit cards but many small restaurants will not. - Athough we are in the European Union, Croatian currency is still Kuna (1EUR= 7,67HRK). If you didn’t have time to exchange money before you arrived in Croatia, you can do so at the airport. Exchange rates are more or less the same everywhere. There is also an ATM machine on Lopud island, but no bank or exchange office. - Mosquitoes are a common summer pest in Croatia, so bring an efficient bug spray with you, it will make the evenings and nights here more pleasant. You can also buy it in local shops in Dubrovnik, but make sure to have it with you before you reach Lopud island, as there is only one shop there and the prices can be very steep during the high season. Like the title implies, it is a bike tour, but unlike any you’ve ever experienced. We’ll pedal, go down a 5km long downhill, visit ancient sites and enjoy great food with a taste of local wine. You can’t spend every day on the sea. Okay, you can, but a rafting trip on the Cetina River is a different kind of adrenaline adventure and a great way to see a different and beautiful part of the country. If island-hopping and multi-sport experiences make you smile this is the tour for you. Kayak from Lopud and trade your paddle midway through. Bike across Šipan island through vineyards, olive groves, chapels, and medieval villages and stop for a delicious lunch of local delicacies at one of the region’s best kept restaurant secrets. Not everything is about pushing your body to the limit. Sometimes you have to take a moment to enjoy the finer things in life. Perfect for groups who want to pamper themselves enjoying a gourmet lunch while tasting excellent wine. Paddle along majestic limestone cliffs and enjoy Lopud island famous for its sandy beaches. Cliffs and Beaches is an easygoing sea kayaking tour in Dubrovnik with a treat awaiting – perfect places for cliff jumping and lounging on big sandy Šunj beach.